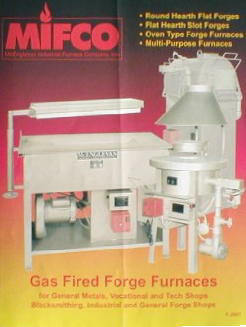 MIFCO has several types of small Forging Furnaces, ideal for a number of applications. Some of these include General Forge Work in Education, Tool Dressing, and Spot Heating in Ornamental Iron Work, General Blacksmithing, Hot Bending, and Forming. Our Multi-Purpose MP-47 can serve as a Melter, Forge, and Heat Treat unit, all in one – perfect for the Educational Environment. For further information, call or email us. Our sales staff will contact you to discuss your needs and prepare a customized quote.